Today I have on my blog author Ruchira Khanna talking about all things writing and life in general. Please give her a warm welcome. Let’s get to know her through this question-answer session. Officially trained to be a biochemist, and worked in the lab for approximately ~7 years. Then could not step out of the home after the delivery of my kid. Blame it on the emotional attachment. Mind was at rest while at home, and could think beyond me-myself, which initiated the awareness around me. This was the foundation or the stepping stone of writing a few words each day. Thus, a writer was evolved. Honestly, I did not plan much for my debut novel. I joined in the wagon of NaNoWriMo with a concept of Destiny. Now, call it fate for myself that my thoughts could evolve while writing in the month of November into a 50K words novel. Pain, Agony is my motivator. I get goose bumps when I see them around, and unfortunately there is plenty thus, motivating me 24/7. This topic is close to all our hearts. We all wanna venture onto a path that will lead to happiness n success. But, then it is either dependant on our kismet or the choices we make. Thus, the concept came up! The society is my inspiration. So far, all have either cribbed/vented over this issue. Thus, thought of tackling it with a story that can help calm our heart and mind over the choices we make in our respective lives. Book Choices gives us a peek into the lives of Mateo and Albert on the choices they were forced to make, but are happy to make a life out of it, and help sustain the expenditure of their families. It gives a brief look into the lives of immigrants on how these men over the turn of events are prepared to cement their passion out over their responsibilities and their priorities. Then I take the reader upon the journey of a young boy, Leonardo, who has a passion for something. His whole life revolves around that strong interest, but along the way he comes at a cross-road that makes him ponder over the fire within versus the stuff that gives him joy and satisfaction. I hope the reader can connect with those thoughts! Leonardo is a young boy who got to see a lot of harsh realities as a kid, thus he has no apprehensions but to look within and concentrate on his passions and make sure he fulfills them. The book takes the reader on a journey of this boy’s life where he reaches the crossroads of life, and he has to make a choice with regards to his future. I do nothing about it, and actually enjoy that empty space within me! I need my space when I write. Thus, weekends are my most challenging time to pen down words. I used to vent about it, but now I have just given up writing over the holidays. Working on a novel that encircles around hope! Many; since all books have something unique to relate to. Thanks for being on my blog, Ruchira. Definitely like your choice of favourite actor! Recently saw Ek Villain and he certainly took the floor. It was lovely having you here. All the best for your book! A biochemist by profession made a mere choice of enrolling myself into a technical writing course. 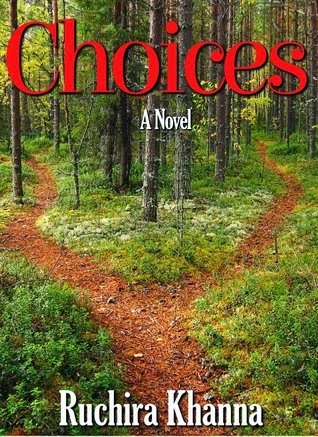 Now, little did I know that this small decision would take me on a path to creative writing and eventually publishing a novel.This novel, Choices helps answer many questions about man’s ambitions and desires and how is it a road towards happiness and contentment that could eventually become your destiny. This is a “slice-of-life” genre thus, impacting all humans who have made a choice sometime or the other in this lifetime!